»Six Nations – une Passion«, so said the headline on the poster announcing the concert that concluded the Jazz Guitar Course 2007 at the church of the village Aigueze, located at the foothills of the Cevennen hills. While all previous courses had mostly been attended by German speaking participants, you can call this year‘s course rightly so “international”. 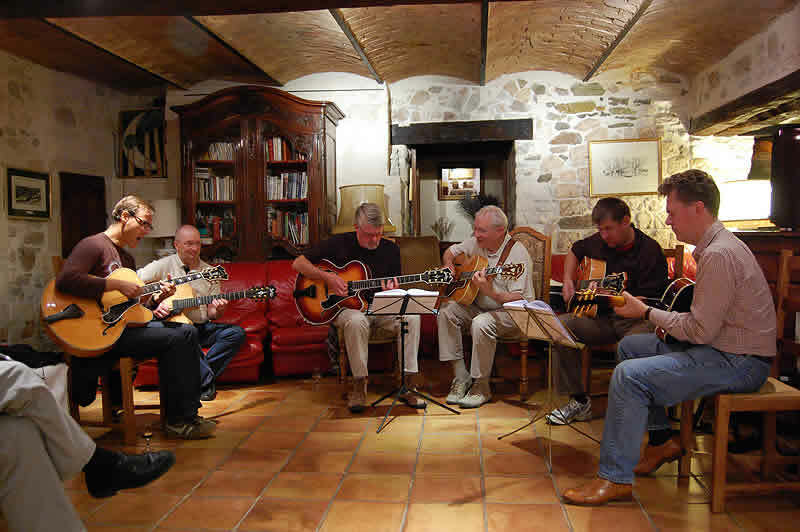 The third course Sonntag Guitars held in southern France was composed of members from Germany, Austria, France, Belgium, England and Norway. 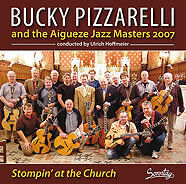 One reason for this might have been the booking of Bucky Pizzarelli. 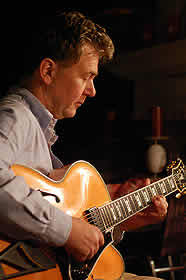 He is a guitarist of excellent artistry and a jazz guitar legend in his own right. No one else could have been better qualified for such an event. While Bucky is not young any longer, he is as fit and agile as some young cat. Sometimes you could get the notion that Bucky feels more comfortable with a guitar in his hands than without. 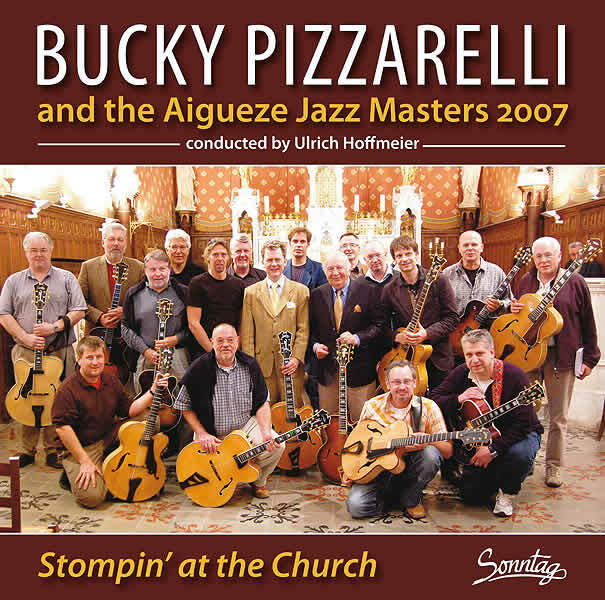 He is a player who witnessed jazz and took part in it from the very first, so it was quite something for all attendees that Bucky shared his “know how” with them. Bucky held his lessons pretty freely. But thanks to his long time being on the road, his substance was derived directly from practical experience. In contrast, Uli Hoffmeier offered basic ideas for walking bass lines and comping, which is his specialty. That knowledge he could elaborate from many years playing for the Europe wide popular German orchestra “Das Palastorchester mit seinem Sänger Max Raabe”. Wittily he managed to juggle with three languages, French, English and German and in the heat of the moment this led to ludicrous confusions sometimes, but this did no harm to the quality of his instruction. So the mood was up for a week full of music and high spirits. A major part of the group had come back for the third time. They had already attended the two previous courses in ‘05 and ‘06. Everybody warmed up in no time and immediately the famous and relaxed “South of France mood” was present. The extraordinary setting of the Residence “Le Castelas”, where the course was being held for the first time, contributed a lot to this situation. “Le Castelas” is in a former medieval castel as the name implies. 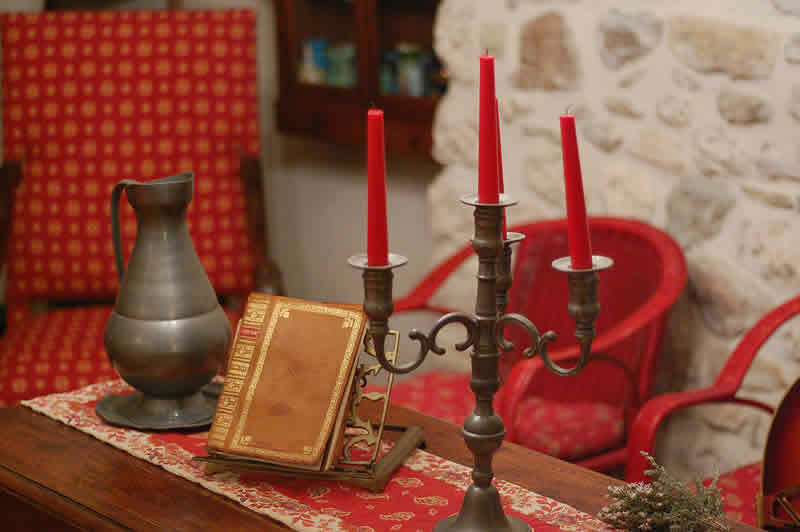 The whole venue has been renovated with great care and each room and apartment was furnished individually. The facility gives such an picturesque impression, that you may believe a knight will clank around one of the many corners of the building at any moment. 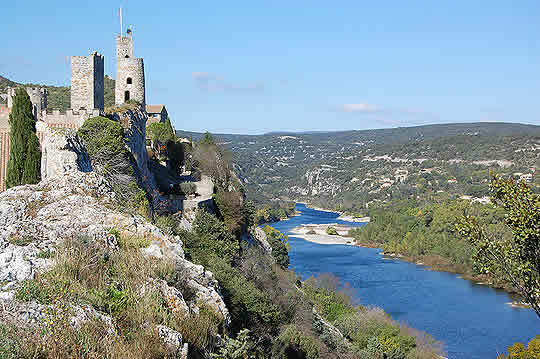 Embedded into an extremely well-preserved, tiny and medieval village, the hotel sits on top of a cliff high above the river Ardèche at the exit of the Gorge de l‘Ardèche. The best part of the hotel is the lovely yard with its turquoise pool, which is surrounded by the accomodation wings. This situation invited downright to spend the afternoon lying on a couch in the October sun, listening to the spontaneous session. This happened regularly after the lessons were ended at 1 pm. Some of the attendees also spent the afternoons by exploring the vicinity. 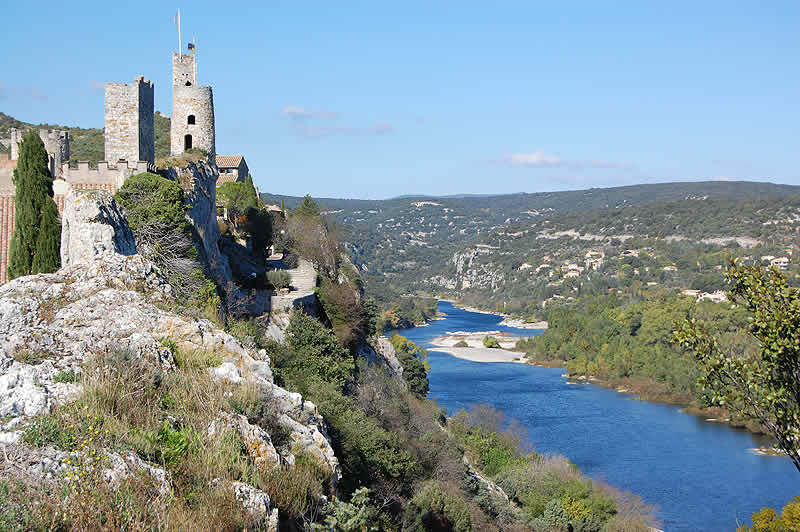 Visiting the famous aqueduct of Pont du Gard or going to a wine tasting at one of the innumerable vineyards of the region, Cote du Rhone. Most of the time was spent with playing guitar together, somewhere around the hotel or on one of the many terraces which were available with the rooms. From there one had an impressive vista over the gorgeous Ardèche valley or over the vineyards on the ridges of the Cevennen hills. Anyway, you always could hear the pling, pling, pling of some guitars from somewhere. Most preferred however were the evenings, when the course gathered in the lounge to end the day with a session and a glass of wine. At these meetings, some of the attendees gave their best! Hans Reumann, Your naughty songs, Jean-Pierre Lienard, you made the rhythm throb! Uli Hoffmeier, you are an entertainer on your own, Armin Bonner, Denis Straub, Rowland Jones, Alberto Margalef and all you others: it was great, great music. What a pleasure it was to listening to your playing! “Belgium, ten points”. The week was crowned by the concert on the last evening of the course. This has become a tradition by now. 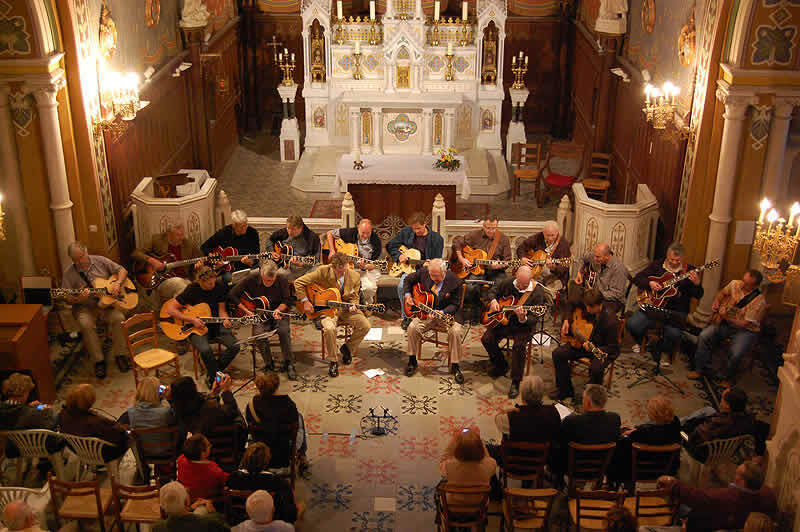 The gig took place at the said church of Aiguèze. This location was generously provided by the administration of the village. Slogan of the evening was: “No amps!”, given by Bucky Pizzarelli. He had to learn playing guitar the hard way, i.e. there was no amplification available in the pre-war period. Thus he developed a unique sense for the beauty of the unamplified, acoustic tone of the guitar. The concert was played in that spirit. And it worked out perfectly! All of the attendees and both tutors performed. An 18 piece guitar big band hit the stage. 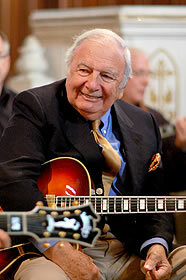 During his lessons Bucky Pizzarelli worked with the two groups on some tunes, which were performed together then, e.g. “Stomping at the Savoy”, “Snowfall”, and “Nuages”. Duos and trios were performed as well. To our big surprise the church was packed. The hotel manager, Hervé Ventajol, organised the concert well. Many thanks to him! The audience honoured the artists with frenetic applause. Because no statues fell off the wall and the music was played on an outstanding level, we may repeat the performance with the “Aiguèze Jazz Masters” at the same place again next year in 2008. Alas, the Jazz Guitar Course 2007 was over at the end of the concert, but thank goodness, it will not take a whole year until the next course is held: For those of you who intend to enrol in 2008, the course will take place from September 2nd- 6th, 2008. Lastly to be precise, there were more than six nationalities that formed the course. One of the attendees from Great Britain stems from Wales and is living in Italy. Ça fait “huit nations”, right?